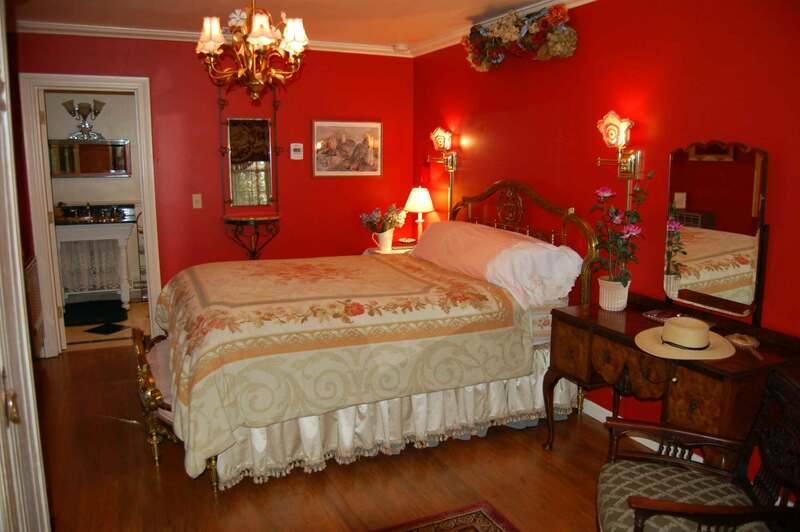 The Moulin Rouge Suite, or honeymoon suite, is located in the green cottage, and is rich with sensual colors and paintings. It features a queen size bed, a sitting area with a love seat looking out on the garden, and a large private marble-tiled bath with a double headed shower for two people and a hand hammered silver sink and free internet. The Moulin Rouge Suite has it’s own porch for a private petit dejeuner while enjoying the view of the garden. This romantic room is perfect for your wedding night! Call 530.626.4420 to book this room! The Claude Monet Water-Lily Room is located in the green cottage and is named for it’s hand painted wall murals of Monet’s famous painting of Giverny France. 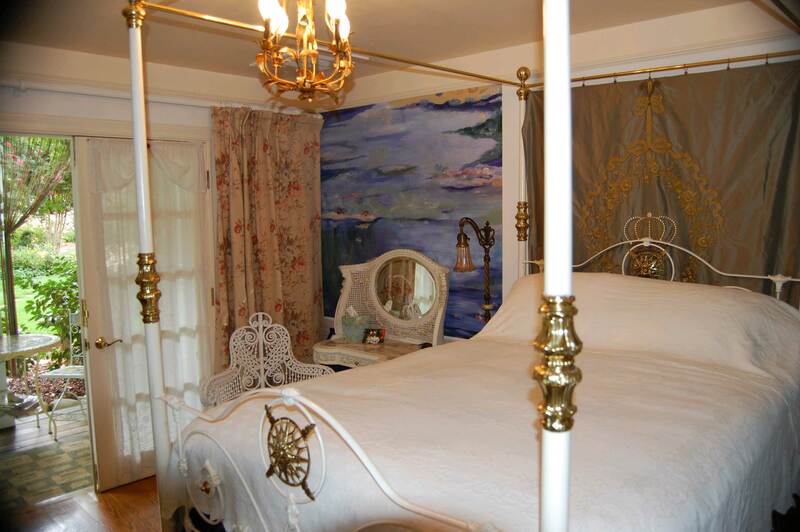 This room has an 18th century English Birds Nest large full size porcelain bed and private bath, a stenciled French pedestal sink and antique claw-foot tub with shower, free internet and is child and pet friendly. Guests enter from the porch of the Green Cottage through French doors. The window opposite the bed overlooks the garden. This private, spacious, 1859 Gold Rush cottage is located in the garden and is surrounded by a white picket fence. A beautiful hand painted mural of Lake Tahoe with wisteria accents decorate the kitchenette. This cottage has a queen bed, and an French 18th century ornate twin day bed, television, shower and private patio, free internet and is child and pet friendly. The kitchen has a microwave and refrigerator. The Art Deco room is on the garden level of the main house and is entered through an ornate white wood portico. The outside walls are constructed of thick placerite stone, hand hewn over one hundred-forty three years ago. Outside the entrance is a private seating area where the shady quiet of the garden may be savored. The Art Deco room is decorated with movie memorabilia from Mohammad Ali, Kate Hepburn, Tony Curtis and Lauren Bacall. This room is furnished with an authentic French Art Deco bronze twin bed, there is room for an extra bed to accommodate one more person. The piano can be played without disturbing anyone. This room also features a private bathtub and shower, state of the art heating and air conditioning, free internet and is child and pet friendly hotel room.